Roboticists are envisioning a future in which soft, animal-inspired robots could be safely deployed in difficult-to-access natural and human-made environments, such as in delicate surgical procedures in the human body, or in spaces too small and unpredictable to be conquered with rigid robots or too dangerous for humans to work with rigid robots in. Centimeter-sized soft robots have been created, but thus far it has not been possible to fabricate multifunctional flexible robots that can move and operate at smaller size scales. A team of researchers at Harvard’s Wyss Institute for Biologically Inspired Engineering, Harvard John A. Paulson School of Engineering and Applied Sciences (SEAS), and Boston University now has overcome this challenge by developing an integrated fabrication process that enables the design of soft robots on the millimeter scale with micrometer-scale features. 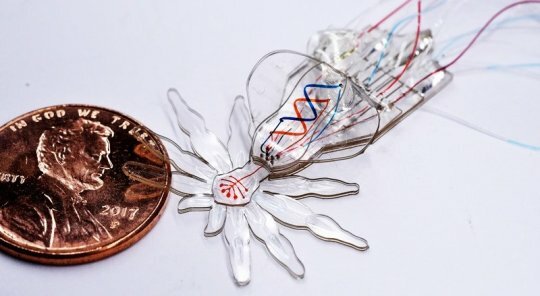 To demonstrate the capabilities of their new technology, they created a robotic soft spider — inspired by the millimeter-sized colorful Australian peacock spider — from a single elastic material with body-shaping, motion, and color features. The study is published in Advanced Materials. In their Microfluidic Origami for Reconfigurable Pneumatic/Hydrolic (MORPH) devices, the team first used a soft lithography technique to generate 12 layers of an elastic silicone that together constitute the soft spider’s material basis. Each layer is precisely cut out of a mold with a laser micromachining technique, and then bonded to the one below to create the rough 3D structure of the soft spider. Key to transforming this intermediate structure into the final design is a pre-conceived network of hollow microfluidic channels that is integrated into individual layers. With a third technique known as injection-induced self-folding, pressurized one set of these integrated microfluidic channels with a curable resin from the outside. This induces individual layers, and with them also their neighboring layers, to locally bend into their final configuration, which is fixed in space when the resin hardens. This way, for example, the soft spider’s swollen abdomen and downward-curved legs become permanent features. The remaining set of integrated microfluidic channels were used as additional actuators to colorize the eyes and simulate the abdominal color patterns of the peacock species by flowing colored fluids; and to induce walking-like movements in the leg structures. “This first MORPH system was fabricated in a single, monolithic process that can be performed in few days and easily iterated in design optimization efforts,” said Ranzani.